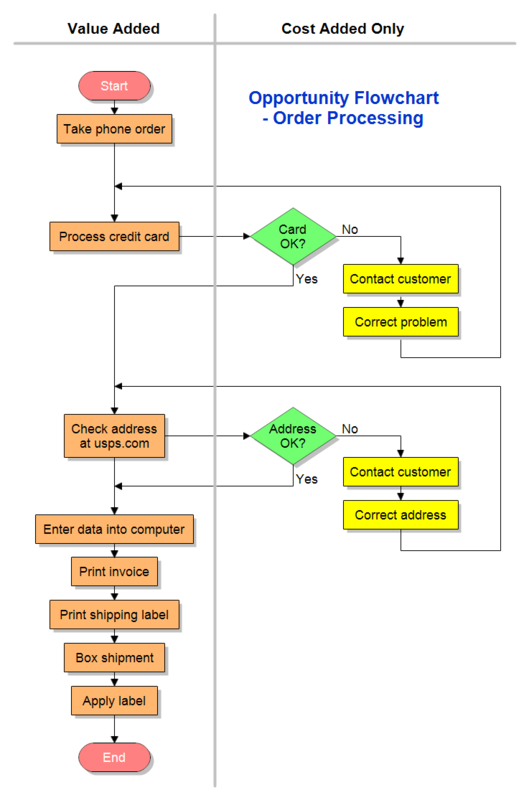 Opportunity Flowchart Description This opportunity flowchart shows the steps involved in processing an order. When things go right, the steps in the left column are taken. When things go wrong, the steps in the right column are taken. Opportunity flowcharts show the steps in a process and also show whether each step adds value to a product or only adds cost. Value-added steps are shown in the left column. These are the steps taken when everything goes right. Cost-added steps are shown in the right column. These steps only occur when things go wrong. If there are no problems, then only the steps in the left column are taken. Opportunity flowcharts allow you to see where a process can be improved. They highlight the opportunities for improvement. Opportunity charts separate those essential steps for making a product from those that are included only to check for or fix problems. You can first draw a detailed flowchart of a process and then separate the steps into value-added or cost-added-only. Ask yourself, "Would this step be needed if the process worked perfectly?" By looking at an opportunity flowchart you can quickly see how much work is caused by things going wrong. Opportunity flowcharts allow you to see where a process can be improved. Once RFFlow is installed, you can open the above chart in RFFlow by clicking on order_processing_opportunity_flowchart.flo. From there you can zoom in, edit, and print this sample chart. It is often easier to modify an existing chart than to draw it from scratch. Click the Opportunity Flowchart stencil and then click the Add Stencil button.